``Al Unser Jr.'s Turbo Racing is a racing game for the Nintendo Entertainment System console and was developed by Data East in 1988 and released in 1990. This game features a season mode and two time trial modes. In season mode the player uses either Al Unser Jr. or make their own driver. Though it is a Formula One based game, Al Unser Jr. was a CART driver. 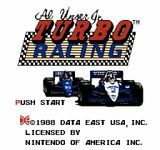 Versions released outside of North America were simply titled Turbo Racing with all references to Unser removed, due to the relative obscurity of CART and Unser outside of North America. Source: Wikipedia, "Al Unser Jr.'s Turbo Racing", available under the CC-BY-SA License.